Heavy rains are soaking the state Capitol, forming puddles over the blue-green ceramic mosaic in the courtyard -- called Aquarius or water bearer -- rippling into the Senate chamber and leaking into basement offices and hallways. "The way we have it under control is, everywhere it is leaking we are somehow catching it, and we will empty it out," said state Comptroller Russ Saito. State workers have been scrambling since late Friday to contain or divert the water. Friday evening's downpour was more than the city's storm drains could handle, and water started backing into the Capitol's drainage system, which connects to the city storm drains, Saito said. Water from the city system was shooting up into the Capitol's atrium, turning the drains into geysers as water poured into the Senate and flowed down stairwells leading into the basement. 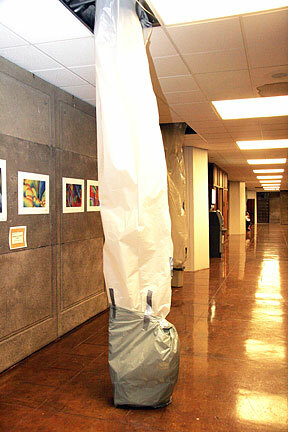 Plastic sheeting, tape and trash cans were being used yesterday at the state Capitol basement to catch the rain overflow from damaged ceilings caused by backed-up drains. Ben Villaflor, Senate sergeant-at-arms, said the water "just poured in." "About 9 p.m. Friday, we called DAGS ( Department of Accounting and General Services), and they came to clean the pipes," Villaflor said. Saito said state workers also installed check valves to keep the city storm drains from backing into the Capitol system. "The problem is that the rains were so heavy," Saito said. "The rains kept coming, and the rotunda became a pond. We could pump the water out of the rotunda, but there was no place to pump it to. We had several 50-gallon drums and were trying to pump it into the drums," Saito said. Then the ponds started to leak into the basement through cracks in the concrete floor between the basement and the entry level. "Until the rain subsides, until the city storm drain can handle the load, we are going to be out there with pumps and literally just trying to keep the water out of the doorways," said Saito. Below ground in the Senate supply room, supply clerk Debbie Aki surveyed shelves of legal pads, reams of paper and notebooks covered in plastic sheeting. "So far we only lost one telephone," Aki said. "DAGS came in late Friday and they had it cleaned up. They say they will fix it once it dries up," Aki said. In the hallways by the Capitol auditorium, DAGS worker Kenton Short was running plastic tarps from the leaks down into storage barrels to catch water. "This is just a temporary fix, until we can get outside and find a good dry day to fix it," Short said, taping together one of about five plastic shrouds in the basement corridor. "We have a plan, but Mother Nature isn't cooperating. We can only handle so much water," Saito said.